Click on the infographic to understand how Solid-State works! Protects material properties of the incoming feedstock. Since the materials are heated only slightly, the materials do not experience changes in grain size, precipitation reactions, nor phase changes. The properties of the incoming feedstock are the same as the properties of the final part without post processing (such as heat treat, HIP, etc). Bonds dissimilar metals without creating brittle inter-metallics seen in fusion based welding. This capability enables Fabrisonic to print custom materials to design a material with a given material property. For instance layers of Aluminum and Titanium can be combined to produce an armor product that is lightweight but has sufficient ballistic performance. Embed Electronics in solid metal parts. Many electronic components including microprocessors, sensors, and telemetry have been successfully embedded in solid metal part using UAM. The low temperature bond allows delicate components to be embedded in solid metal without overheating. 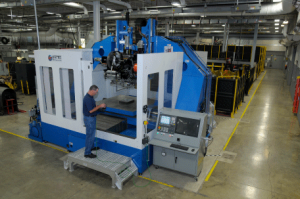 Fabrisonic’s production machines start out life as a commercial 3 Axis CNC mill. To the base mill, Fabrisonic adds it patented welding head for additive manufacturing. The print head is treated as another tool in the CNC tool change (see video below). The additive head is used to add material to produce a part that is near net shape. The mill can then be used to CNC machine final true shape. The hybrid system allows for a silky smooth final surface finish as well as tolerances of +/-.0005”. 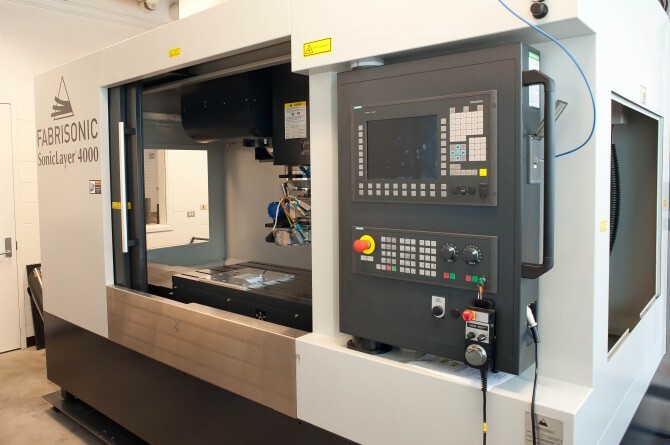 Tolerances are further improved in that the part has always been in one machine. There is no error generally associated with parts that have to be located in two or three machines during production. The hybrid system is also perfect for repair applications. Worn parts can be installed in the SonicLayer machine which can both machine away damaged areas and build them back up with the additive sonic head. Many 3D printers measure material deposition in fractions of a cubic inch per hour. At these rates, parts are restricted to a small envelope that can be printed in a reasonable amount of time. Fabrisonic’s line of SonicLayer machines print from fifteen to thirty cubic inches per hour. This allows for much larger build volumes. The SonicLayer 4000 has a bed of 24” x 36” while the SonicLayer 7200 can accommodate parts 6 ft x 6 ft x 3 ft.
Find out more how 3D-printing can help bring your ideas to life. Fill out a request form and our experts will follow up with you soon.